This book presents a new picture of the politics, economics and process of government in the Soviet Union under the leadership of Nikita Khrushchev. Based in large part on original research in recently declassified archive collections, the book examines the full complexity of government, including formal and informal political relationships; economic reforms and nationality relations in the national republics of the USSR; the treatment of political dissent; economic progress through technological innovation; relations with the Eastern bloc; corruption and deceit in the economy; and the reform of the railways and construction sectors. 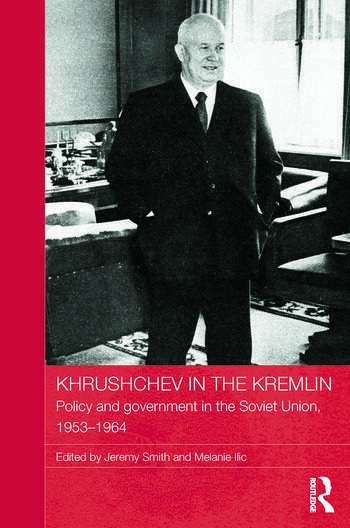 The book re-evaluates the Khrushchev era as one which represented a significant departure from the Stalin years, introducing a number of policy changes that only came to fruition later, whilst still suffering from many of the limitations imposed by the Stalinist system. Unlike many other studies which consider the subject from the perspective of the Cold War and superpower relations, this book provides an overview of the internal development of the Soviet Union in this period, locating it in the broader context of Soviet history. This is the companion volume to the Jeremy Smith and Melanie Ilic’s previous edited collection, Soviet State and Society under Nikita Khrushchev (Routledge, 2009). Jeremy Smith is Senior Lecturer in Russian history at the Centre for Russian and East European Studies (CREES), University of Birmingham, UK. He is author of The Bolsheviks and the National Question, 1917-1923 and The Fall of Soviet Communism. Melanie Ilic is Reader in History at the University of Gloucestershire, and Research Fellow at CREES, University of Birmingham, UK. She is co-author of Women in the Khrushchev Era.